Apologies for the lack of regular post on this blog but with all my old routines gone my painting and posting is more than a little erratic. 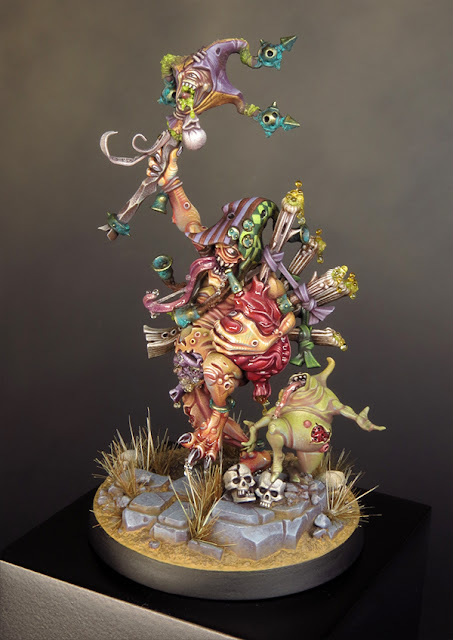 In truth I’ve decided to focus my hobby time on painting with social media and blogging taking a back seat for the time being. This is working out very nicely for me as I’m getting a little more painting time and, most importantly, I’m enjoying myself. In my last post I had just about finished the Sloppity Bilepiper but I'd yet to paint his base. With the luxury of a little more time I’ve now done that and it feels so good to have completed a project. The process has been fairly intense as there was a lot of going back and forth to tweak some of the details. 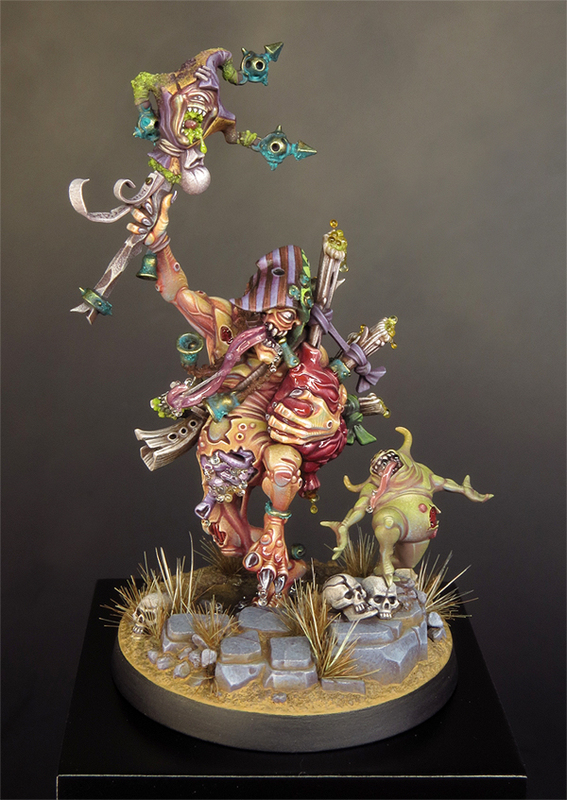 As the Bilepipe, his nurgling companion and the base came together many of the tones, hues, textures and finishes were adjusted to balance out the overall composition. It was all a bit fiddly and in some places very subtle but it’s really helped to tie the elements together. It’s been a satisfying experience to finesse a project without any deadline pressure. The base incorporates my first use of resin water effects for creating the puddle the Bilepiper is stepping in. Admittedly it’s a cautious use of resin but I wanted to start off with something straightforward before getting more adventurous. I can see myself doing more water bases in my future. I’d initially intended to keep the slime and drips to a minimum but as the project developed I realised this was not the right mini for that approach. He is after all called a SLOPPITY Bilepiper and that suggests more than a little sloppyness. So out came the microbeads, UHU glue and plenty of gloss varnish. 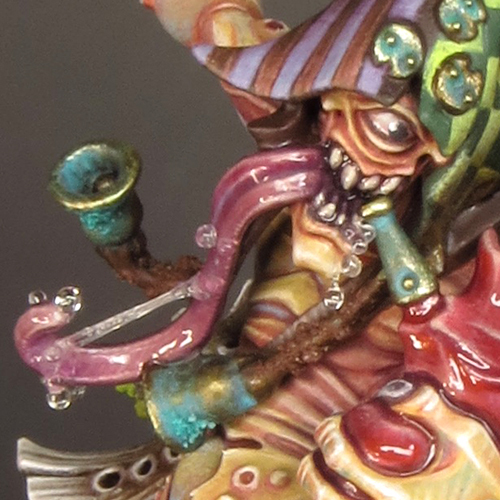 My Bilepiper is now appropriately sloppy and is pipes are oozing bile! In contrast to the slime I wanted to add some rough textures for the mould and corrosion. In the past I would have used my old friend baking powder but I’ve finally found what seems to be a perfect replacement. 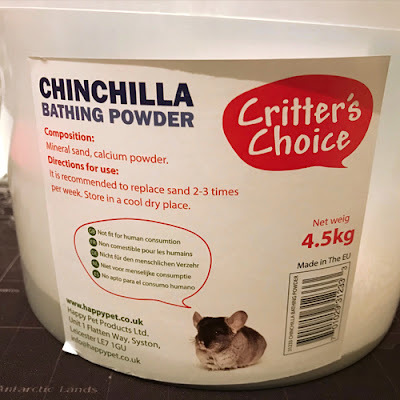 Chinchilla bathing powder, a mixture of mineral sand and calcium powder, has the right texture and best of all takes and holds colour very well! Fingers crossed it will, unlike baking powder, be stable over the long term. So there we have it, the finished Sloppity Bilepiper. I started this as a ‘quickie’ after Mark came home from hospital but, as usually happens, the project drew me in and I’ve invested a lot of time into it. 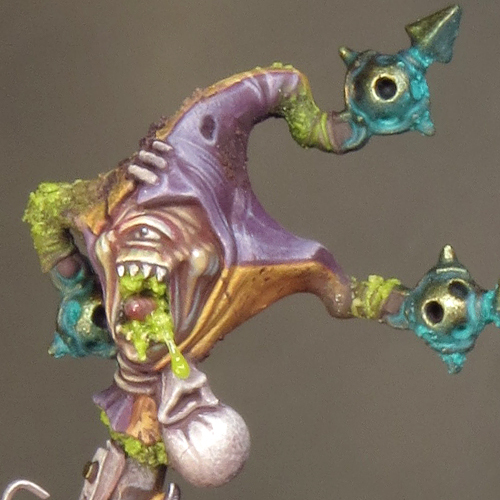 But I think it’s been time well spent because I’m very happy with the finished result and painting the Bilepiper has helped me get into the swing of a new painting routine! Are you planning to enter it into any competitions? Thanks! 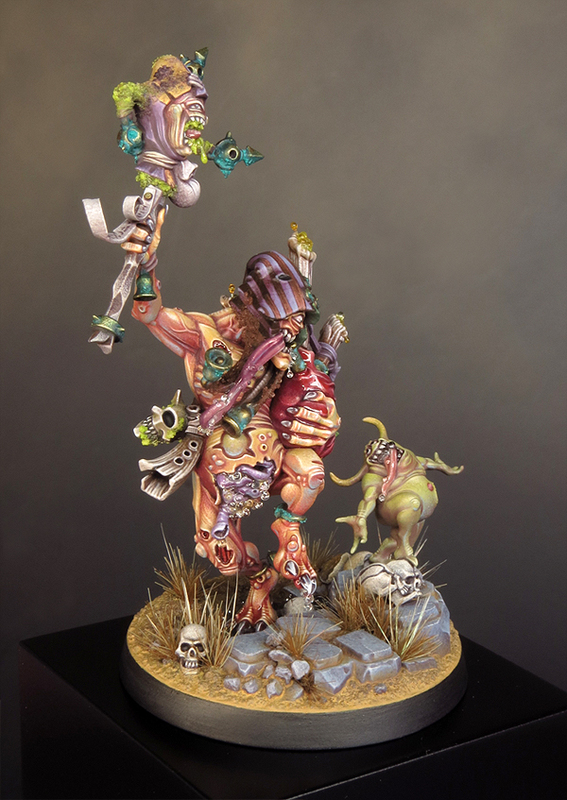 I hope I'll be able to make it to Warhammer fest this year and enter it in the Golden Demon - fingers crossed. fantastic work on this model. 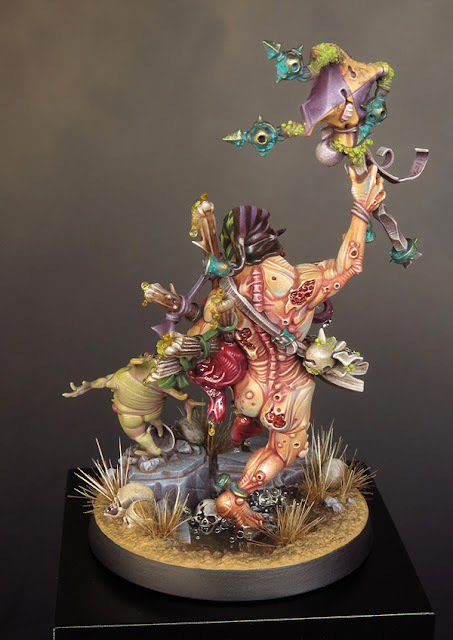 I especially like the touches of grey in the skin, that's a great idea. When it comes to making moss or anything using a very thin powder, I use micro ballons by deluxe materials. It is extremely fine, and as it is polystyrene it is very stable. Hi Maxime and thanks! 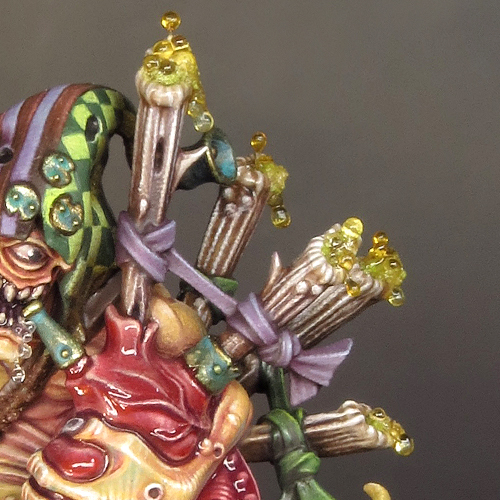 I've used micro ballons too, on my poxwalker & Horticulous Slimux. What I really like about the chinchilla bathing powder is that it takes colour really well as it seems to absorb it slightly. It may prove to be less stable than the micro ballons over time but I've got my fingers crossed. I've also got a 4.5kg bag of the stuff so if it dosn't work out I'll have to get a chinchilla!!! Excellent work. Absolutely beautiful combination of colors.